You can profit from your passion no matter what it is thanks to the internet. The invention of the internet has led to a money-making revolution. People all over the world are turning their passions into profits, doing anything from writing blogs (like this one!) to selling adorable plushies shaped like human organs, to streaming themselves eating massive quantities of food. With so many people vying for attention on the global stage, it can seem nearly impossible to break through yourself. But Gary Vaynerchuk, author of Crush It! Why NOW Is the Time to Cash In on Your Passion, believes that making money doing what you love is the easiest it’s ever been, and the time to strike is right now. 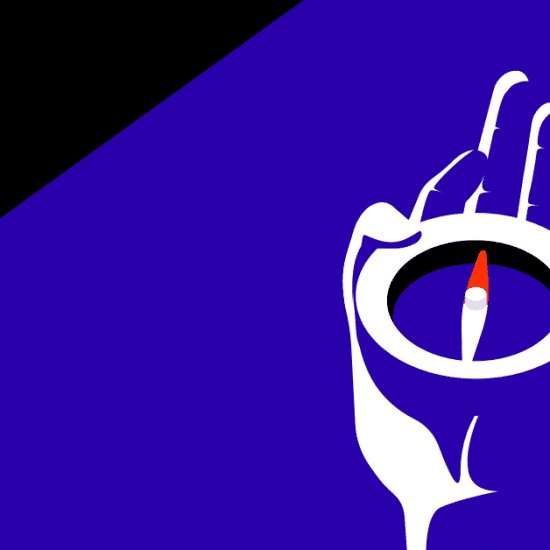 Neither Vaynerchuk nor Fabulous can tell you what your passion is. We can tell you, however, that the road to finding and developing your passion is a long one and will require a solid foundation that starts with you, your health, and your habits. Here are three habits to build to help you crush it! There’s no way around it; monetizing your passions is hard work. Doing the things you love will be fun and exciting, especially at first, but it’s easy to get bogged down by the day-to-day drudgery. When your initial inspiration fades, how will you keep yourself motivated? And when so many things are demanding your attention at once, how can you stay organized? Deep work is a way of working that allows you to fully focus on one task at a time. This puts you in a state of flow, which increases your creativity and productivity. 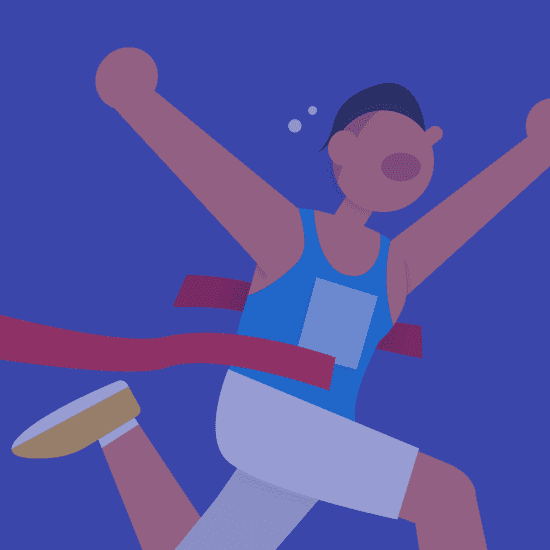 When you’re able to regularly dedicate long stretches of time to one task or project, you won’t need motivation or inspiration to keep moving forward. You’ll have discipline instead, which is far more reliable. 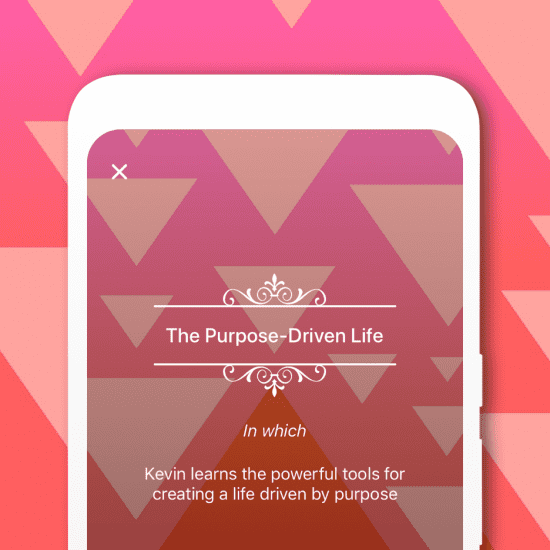 Fabulous has a whole journey that’s designed to help you master the fine art of focus. 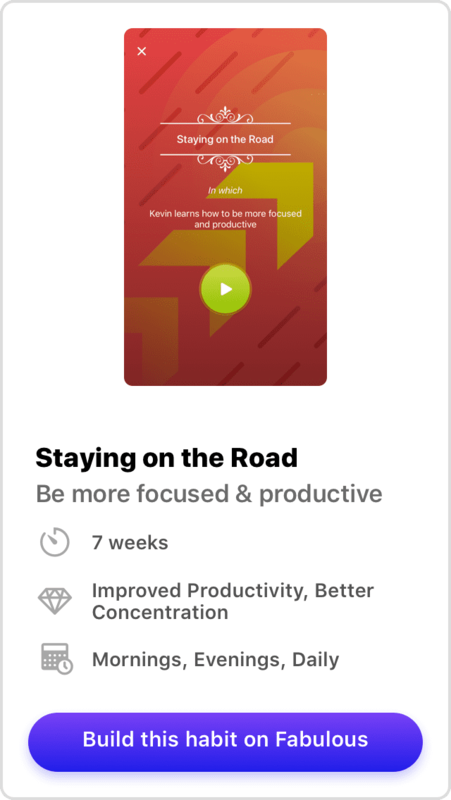 Check out Staying on the Road and learn how to minimize distractions, prioritize tasks, and stay on top of your goals. Things can get pretty crazy when you start a new adventure like launching a new business. In addition to the work that goes into developing your personal brand, creating content, and growing your audience, you still have to deal with your everyday life. You may already have a day job you can’t quit, or perhaps you’re a full-time student or a homemaker with a family. That’s a lot of balls to have in the air! It’s during the especially crazy times that being able to call upon a moment of calm on command can be a lifesaver. A daily meditation practice gives you a chance to momentarily withdraw, decompress, refocus, and restore yourself. Meditation can ground you when you feel swept up in the chaos of your life. It can also energize you when you’re feeling lethargic or doubtful that you’re on the right path. 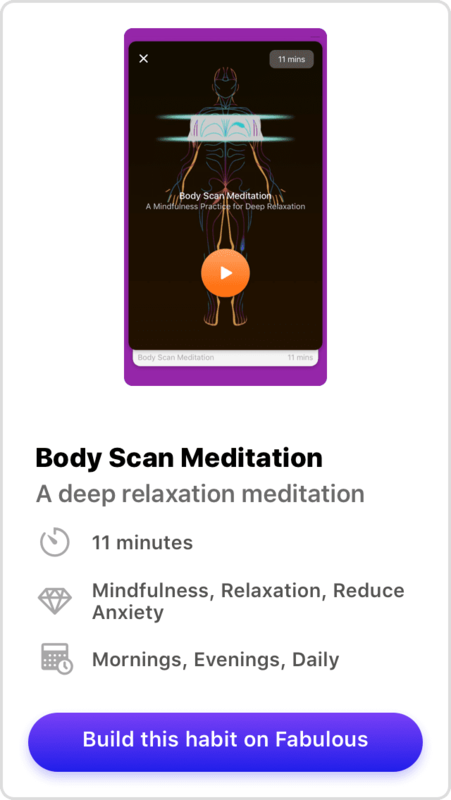 Fabulous has over a dozen guided meditations available on the app. We highly recommend the Body Scan Meditation as a great all-purpose tool and introduction to meditation. You’re discovering your greater purpose in life and developing a personal brand that reflects who you are, what you do, and your values. You’re working hard making content, networking, and interacting with fans. You’ve maybe even picked up some profitable clients or taken on a new and exciting project. Regardless, you’ve been working hard and, finally, you’re beginning to see results… or maybe you aren’t. 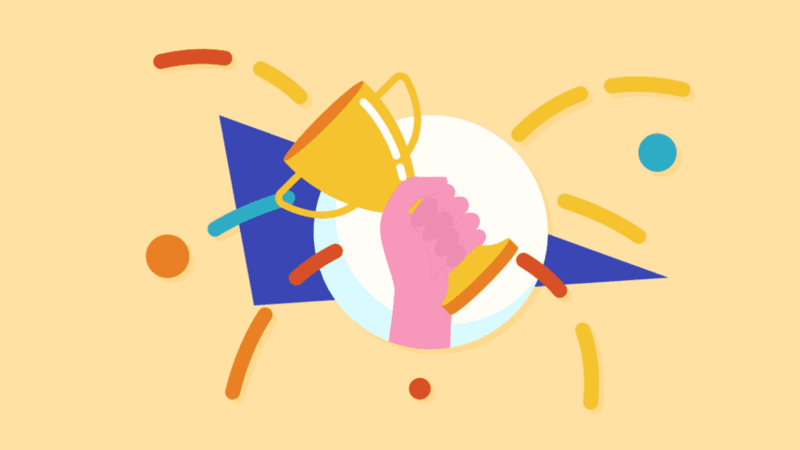 Whether you’re riding high on a wave of achievement or still struggling to keep your head above water, it can be good to pause and reflect on how far you’ve come. Expressing a little gratitude each day can keep your spirits up when you’re not feeling your best. It can also keep you humble when you’re feeling immortal, which can lead to poor decisions fueled by hubris if left unchecked. Keeping a gratitude journal is a great way to reflect on the good things in your life. It’s also good to have a physical record of those moments, for those days when you need an emotional pick-me-up. 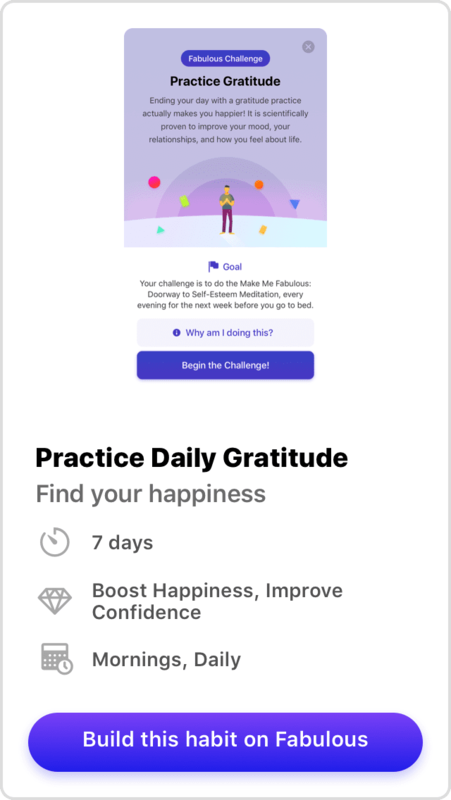 Find the Fabulous Gratitude Challenge in the app and start your gratitude journal today!